A huge best seller made even better! 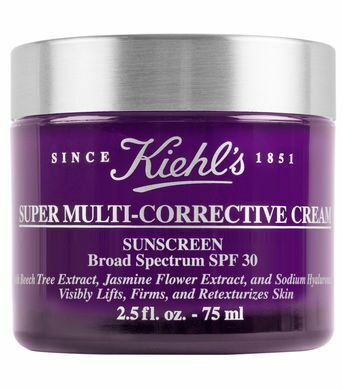 We’ve shared with you already the amazing Super Multi-Corrective Cream from our friends at Kiehl’s, and now, these clever people have improved on this great product by adding broad-spectrum SPF 30 protection to it. We love multi-functional products, and this one tops the charts. This latest release has all the advanced anti-aging properties as its predecessor with the added benefit of sunscreen protection to help decrease the risk of early skin aging caused by the sun. With a mild, pleasant, perfume scent, this thick, rich cream goes on smoothly and is absorbed quickly. In one quick step, you can lift, smooth, sculpt, retexturize, moisturize, and protect your skin. Wow, a fantastic product that simplifies your skin routine in the morning – thank you Kiehl’s!